The Monogatari anime franchise has given us four TV series and several specials since it started in 2009. So it’s all the more surprising that it’s only now that we’re getting the beginning of the story in the first of three films with Kizumonogatari Part I: Tekketsu. The Monogatari series in general follows high school senior—and former vampire—Araragi as he helps out various people haunted by curses, monsters, and other “oddities.” Kizumonogatari is the prequel story of how Araragi first became caught up in the supernatural—i.e., how he became a vampire in the first place and how he managed to be cured. The first film, Tekketsu, is basically the setup for what is to come in the rest of Kizumonogatari. We see the first meetings of various characters we have already met numerous times before in the franchise. However, that’s not to say that these are the characters as we have come to know them. The Araragi in Tekketsu is far from the confident young man we see only a few weeks later in Bakemonogatari. In fact, we learn that he is a friendless loner—and supposedly happy to be one. Of course, that is shown to be an obvious lie when he makes his first friend in the form of the incredibly attractive Hanekawa. Yet, his joy is short-lived as he discovers a trail of blood on his way home from shopping—a trail that leads to the dismembered body of a dying vampire. It is here that we catch a glimpse of Araragi’s true core—the part of him that connects the Araragi of the past and the character we’ve come to know from the rest of the franchise: his sense of right and wrong. 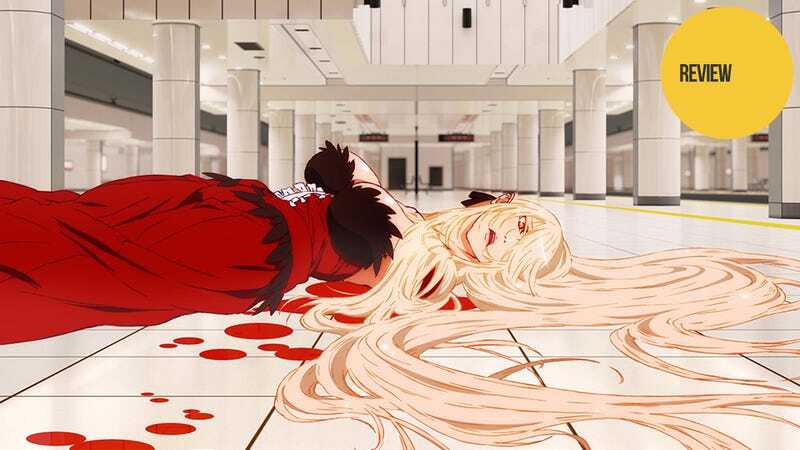 At first, Araragi runs away in fear, leaving the vampire to bleed out in a tantrum of screams and tears. Yet, he can’t just leave her. Knowing that she will surely drain him of blood and kill him if he tries to help her, he returns, unable to let someone—even a monster—die if he has the power to help. This act, more than anything else, tells you what kind of person he is and makes him a worthy hero for the story. Both Araragi and Kiss-Shot (the vampire) are damaged people—both figuratively and literally. After all, it’s right there in the title: “Kizumono” being a damaged or wounded thing and “monogatari” meaning a story. Araragi becomes a vampire himself, unable to go out in the sun without exploding into a ball of fire. And thanks to her injuries, the limbless Kiss-Shot has to take on the form of a child until she is able to regain her missing arms and legs—and the power they contain. Of course, that’s far from the full extent of their problems as no less than three vampire hunters are out to get the pair. From the description above, you can probably guess why Tekketsu was aired in theaters and not on TV. While the anime franchise in general often revels in perverted humor and fanservice (and this film no doubt kicks it up a notch), it’s rare that the series is gory—and the long, tortured scene of a dismembered woman begging for her life is certainly that. But even in that scene, disturbing as it is, the animation itself is beautiful. Kizumonogatari is more than a little visually distinct from the rest of the franchise. The character designs are markedly different (though recognizable) as are numerous oft-visited locations. But the most striking difference is the color palette. While the franchise in general seems to delight in its deep colors, most of the scenes in Tekketsu are orange-tinted, with the vast majority of scenes taking place at sunset or sunrise. But the most striking aspect of the visuals is how they are directly tied to Araragi’s emotional state. When joking around, the film becomes still, cartoon manga panels. However, the more precarious his situation—e.g., when he discovers a limbless body or finds himself set on fire—the more sketch-like the animation becomes with chaotic, indistinct lines. It’s engrossing to watch. The sound design is likewise superb—something rarely noticed when watching a film. While the music and voice acting are as good as you would expect given the series, it is the way the sound is used as a storytelling device that makes it stand out. As Araragi runs away in fear from the limbless vampire, you can hear a baby’s screams mixed in with Kiss-Shot’s own frantic cries. Slowly, the baby’s wailing grows in volume till it replaces the vampire’s voice entirely at the very moment Araragi realizes that vampire or no, Kiss-Shot is a helpless creature in pain. Later in the film, the sound design shines through again when Araragi, now a vampire, encounters the three vampire hunters and finds he is unable to understand their distorted voices. He assumes they are speaking strangely. However, this is far more likely a hint at how becoming a vampire has altered his senses—a way of showing, rather than telling, us about the changes that have happened to him. If there is a downside to Tekketsu, it is that, like the Ghost in the Shell: Arise films, it’s short—barely an hour long. And unlike the individual Arise films, the story isn’t in the least self-contained: The film simply and suddenly ends. That said, Kizumonogatari Part I: Tekketsu is a film that has one goal only: laying the groundwork for what is to come. And it succeeds at that without a doubt. It reintroduces the familiar cast of characters—though not quite as we have come to know them—and tells the story not just through exposition but also through both stunning animation and wonderfully designed sound. Now all that’s left is to wait for the story to continue later this spring. Kizumonogatari Part I: Tekketsu was released in Japanese theaters on January 8, 2016. It will be released in select US theaters on February 26, 2016.